I want to tell you a secret: All Brides Are Beautiful. Every single one of them. The media may have fixed parameters for what is considered beautiful, but don’t let such narrow perceptions get you down. If you’re feeling a little weary about dress shopping because you have a fuller figure, or you feel like you are too tall or too short or too pear shaped or too apple shaped or too whatever, consider some of these tips and you’ll be well on your way to being the gorgeous bride that you have always wanted to be. While flitting from one bridal shop to the next with all your besties in tow might sound fun in theory, the reality is that the “fun” will wear thin pretty quickly. It’s not likely that you will find a perfectly fitting dress off the rack (the same applies to skinny girls just by the way) so you might as well just have one made right from the start. 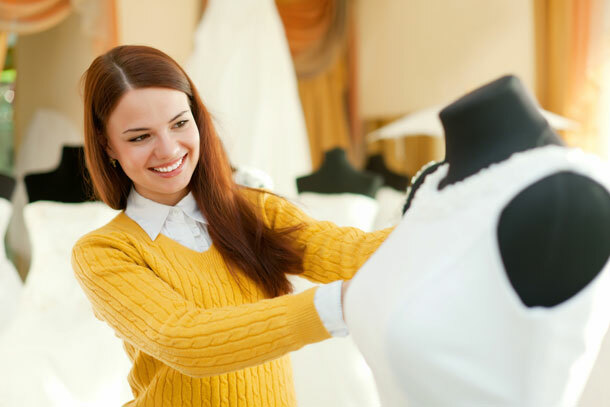 This you will need to do at least 6 to 9 months before the wedding so find yourself a dress maker as early as possible. You don’t have to settle on the first person you talk to. Interview a couple or dress makers and look through their portfolios. You will soon find the right person for you. Dress makers / sales assistants might try you to convince you to choose something that you either don’t like or are uncomfortable with simply because what they are trying to sell you is what they have in stock in your size or because what they are suggesting is easier for them. Don’t let them. There are plenty of places where you will get what you want. You are completely allowed to be a little bit “Bridezilla” about your dress. They might be 100% accurate when they tell you that you look stunning in a particular dress, but if you don’t feel like it is right for you, then it is not. Period. Don’t leave your dress to the last minute because you are hoping to lose weight. It might very well happen that you do lose the weight, but it also might not. Go shopping for a dress that looks fabulous on you now and not one that will look good once you have lost 5kgs. The risk is not worth it. If you do end up losing a bit of weight you can always have the dress taken in a little bit. Where will your Registry Be?